The allotment chores list is growing longer by the day and with the dark evenings, all jobs have to be stuffed into the weekend! Chop and weed the cut flower bed. STARTED BUT NOT FINISHED! Prune the old gooseberry bush, replant (in a more suitable position) and dig over the ‘old gooseberry’ site. STARTED BUT NOT FINISHED! Lay the weed suppressant on the pathways. STARTED BUT NOT FINISHED! Dig wooden raised bed. DONE!!! 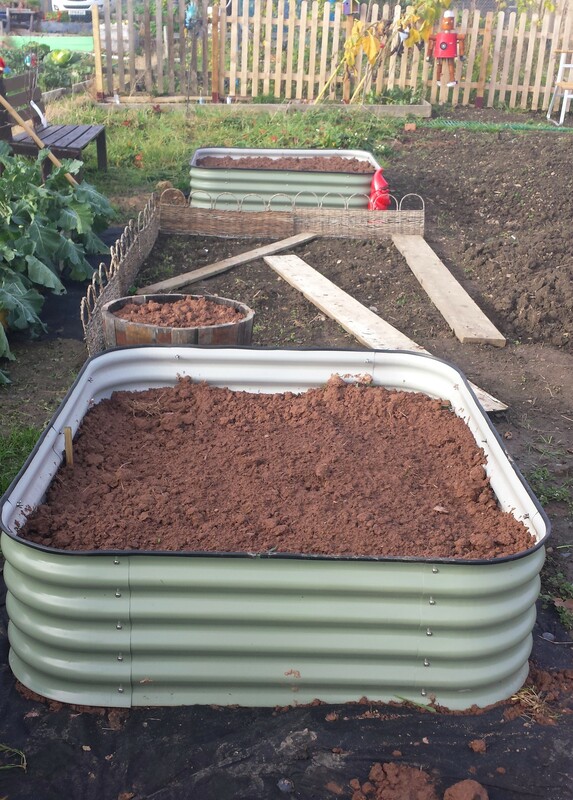 Fill metal raised beds with topsoil, manure and compost. STARTED BUT NOT FINISHED! Pull up beans and poles then dig a bean trench. STARTED BUT NOT FINISHED! This weekend I was lucky enough to have tickets for the Chelsea Flower Show (a Christmas present form the children) so spent most of the weekend in the London area. 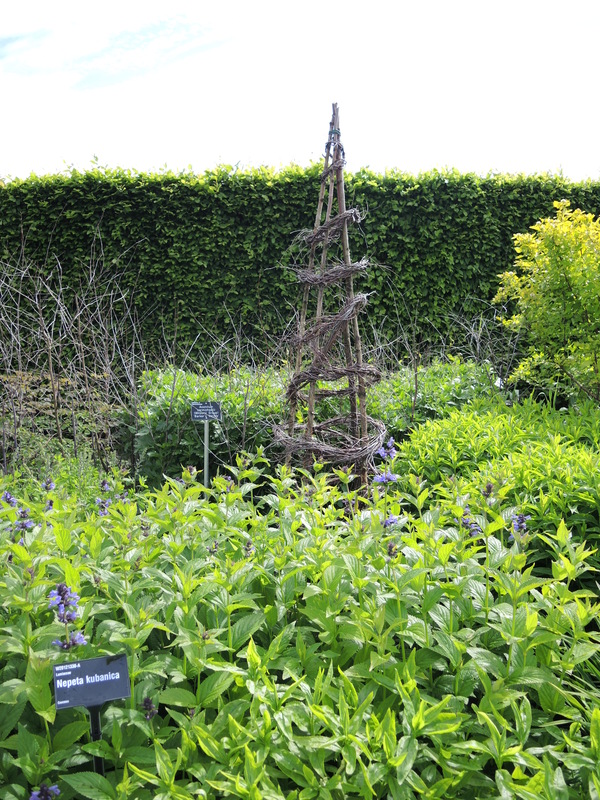 One of the places we visited was RHS Garden Wisley, which contains one of the largest plant collections in the world. 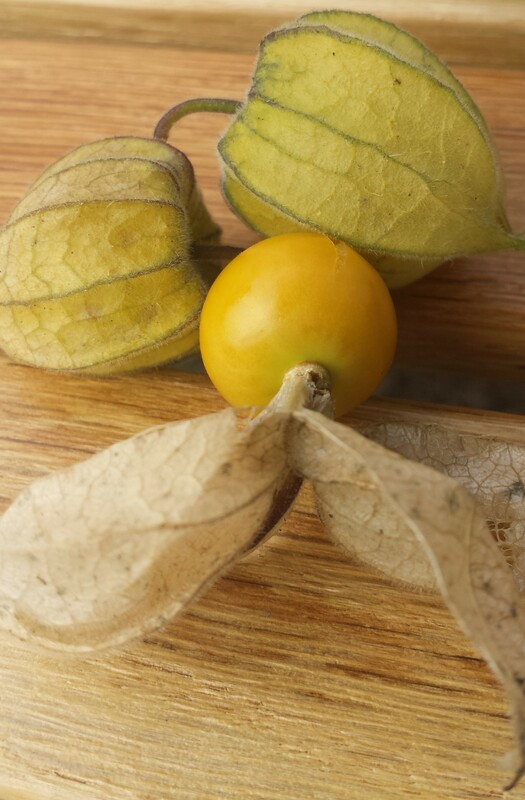 However I’m sure many people have written about the wonders contained in the gardens but I’m focussing on (and stealing) a few details of interest to an allotmenteer. 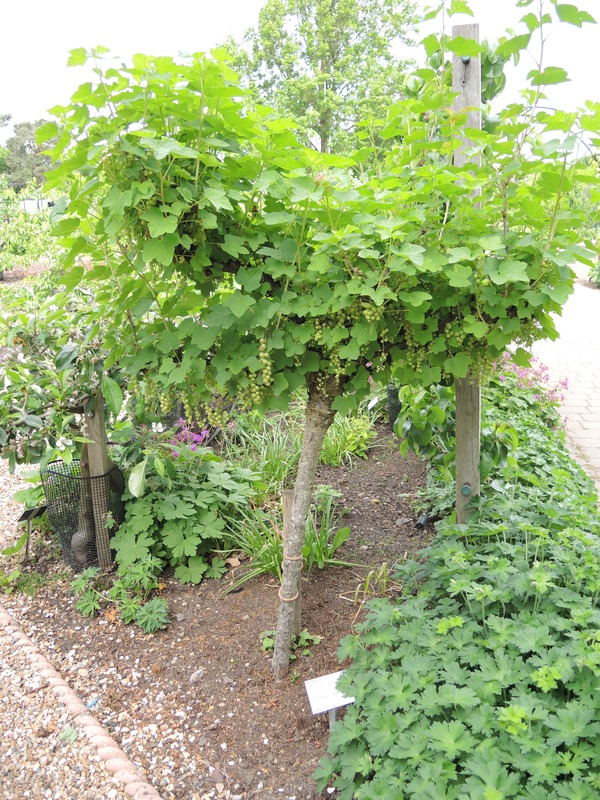 The first was a blackcurrant bush pruned into a standard – freeing up some all important space underneath for a few pots perhaps! 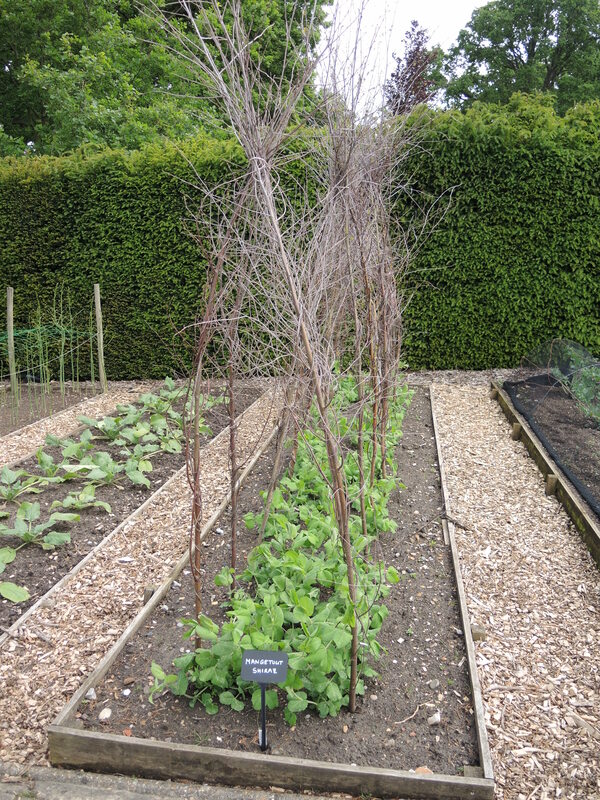 The next two are simple…pretty planting! 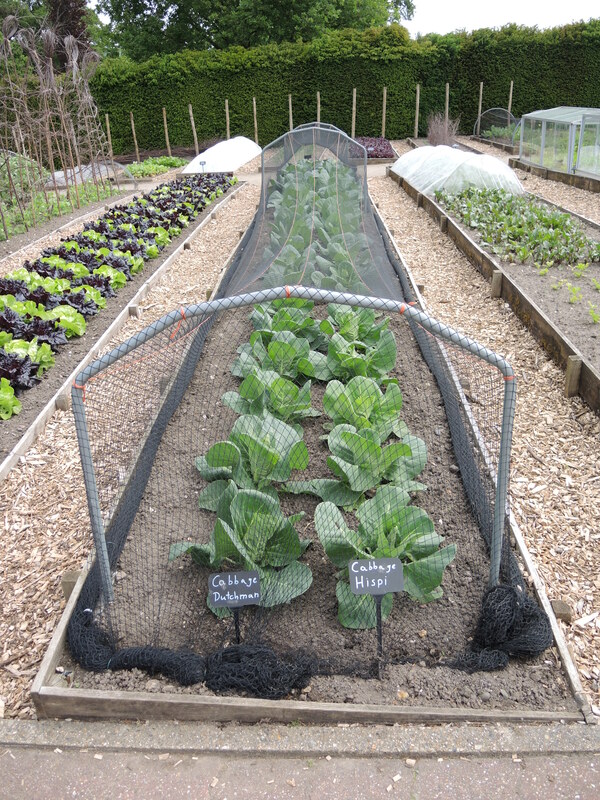 Allotments don’t have to be ugly. A little thought to the planting can add interest. 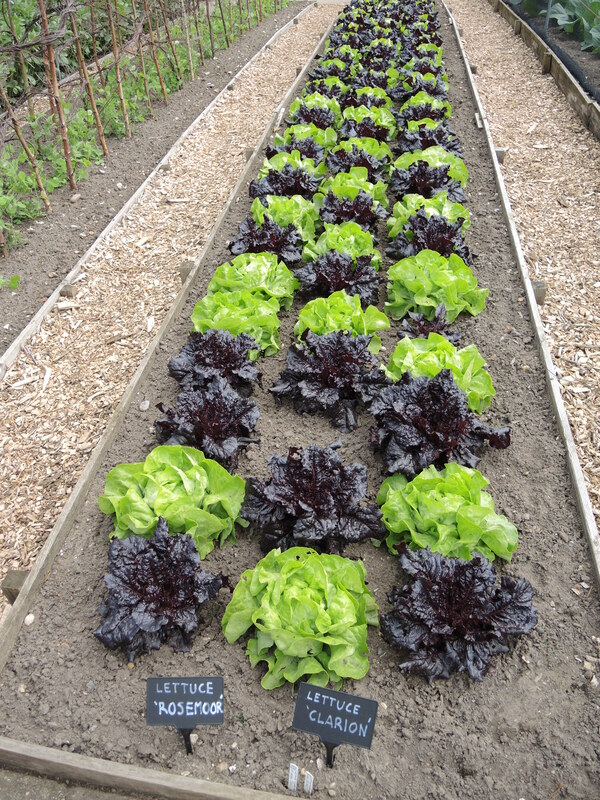 How about a multi-coloured lettuce bed?! A Chive spiral. Why leave it at that? I’m thinking a multi-herb spiral ensuring every space is used. 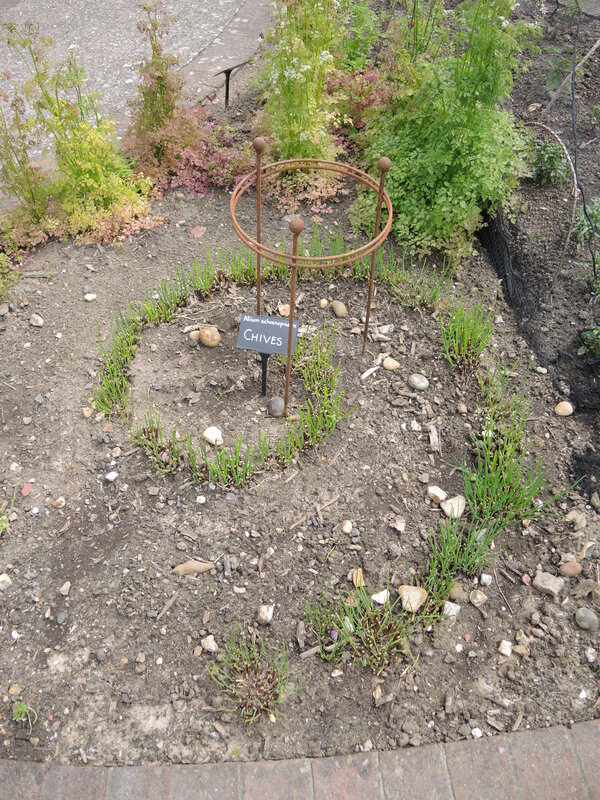 Plant supports also caught my eye at the gardens… a basic four legged support with a twig spiral. 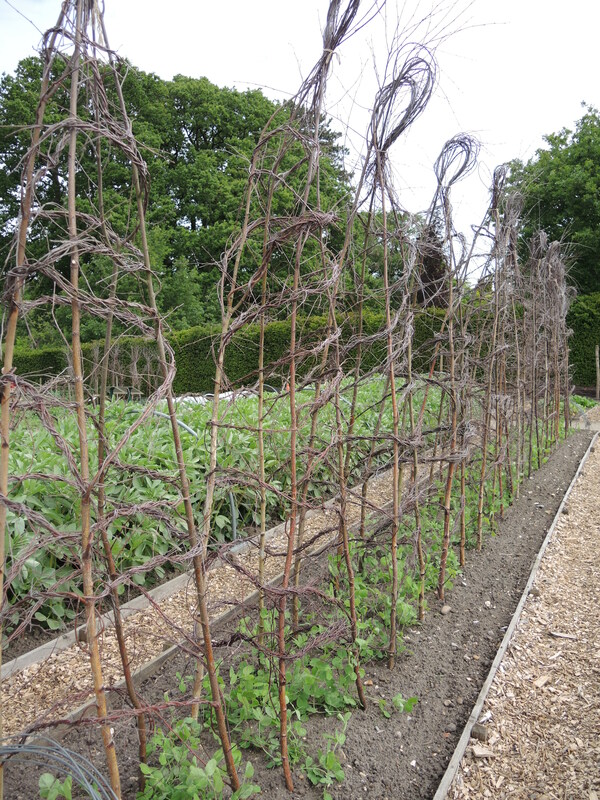 Pea support…they look fab don’t they? Look at the detail…so clever! 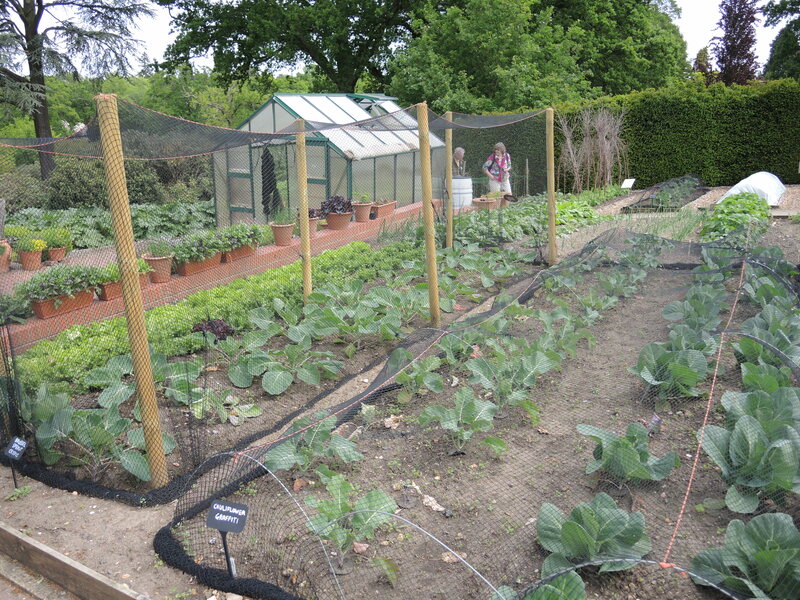 I was keen to find out how the RHS gardeners protected their crops from the ‘Wee Beasties’ too. 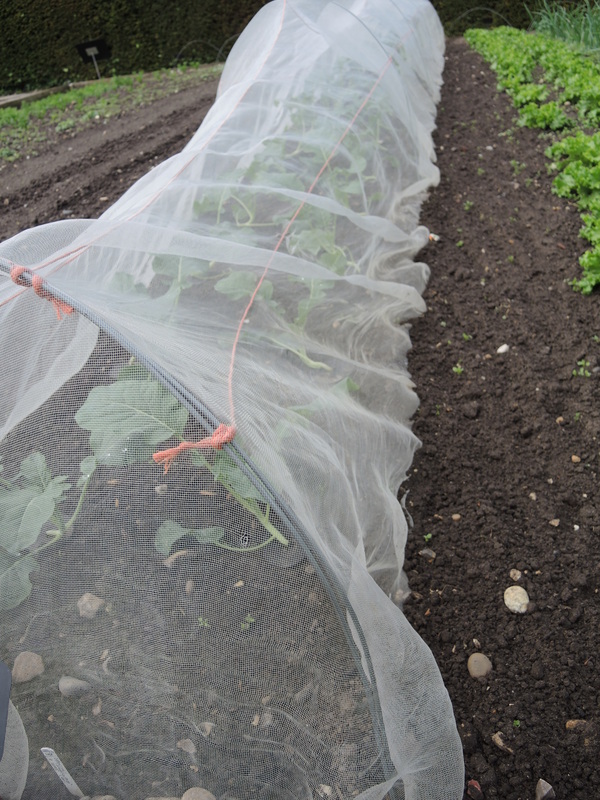 They protected cabbages by earthing over the mesh! 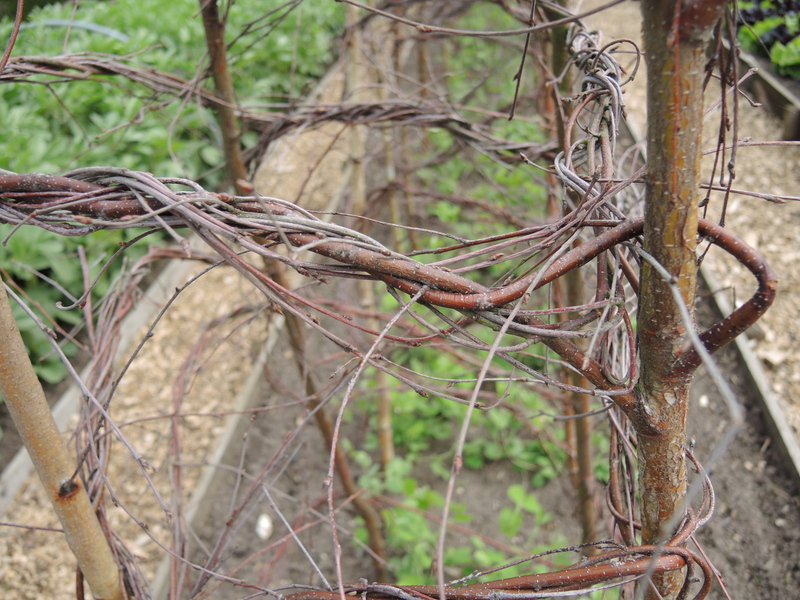 This method was used with hoops, wire and wood. I’m definitely stealing a few of the ideas for my allotment!